[POLL] Should we paint our kitchen cabinets a neutral color? Picture is from before we purchased the house. Elderly people owned it before us and we want to modernize a bit. The blue is all countertop material (not sure what kind, it's thin and can be peeled up like cardboard... we would eventually like to replace it as well). 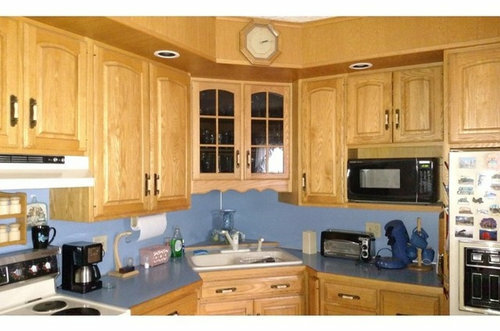 Should we paint the cabinets a neutral color like white or cream-colored? If we paint, we'd have to do all of the wainscoting and built-in cabinetry as well. The wall paint color would probably change to something that matches the cabinets. Any other suggestions of how we can update on a budget are very welcome! Painting cabinets is not really budget friendly. It’s often more expensive than replacing countertops with stone. If you’re planning to do it yourself plan to spend a LOT of time on it. It’s not a weekend project. I did not have the wood enclosed soffit - not sure if that would change my opinion. It makes for a lot of wood in the space. Painting oak can be a bit of a challenge. Many do it successfully, but be aware that the texture (not the color) of the grain will show through - bothers some and not others. Also, wood moves with changes in temp and humidity which can cause hairline cracks in the paint at the joints - again bothers some and not others. This is why factory painted cabinetry is MDF or MDF combined with wood - it is more stable as to movement. The finish of a painted over previously finished wood is not as durable as a factory finish. You will need to do touch ups and this is more likely if it will be a very active kitchen. I do have white trim and I like it very much. 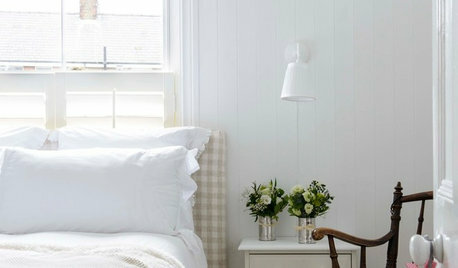 Not in the kitchen, but in other areas, I have white beadboard and I like it with the wood. You might want to start with just the trim and see if that is enough to make you like the space better. Be sure you like the layout of the kitchen before putting any large amounts of money into it. It does not look bad - some do not favor corner sinks, but I have a friend who loves hers. 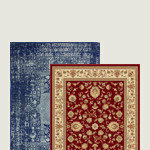 If the layout does not work for you, just save for a more serious renovation. 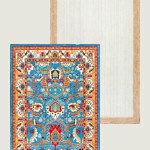 Remove the scroll piece like the one over the sink wherever it occurs and do any finish touch up needed. Change out handles. I would paint or tile the backsplash and replace the counters before I would paint the cabinets. DIY cabinet painting tends not to hold up well over time. If I were going to paint, it would be walls, wainscoting, and/or soffits over the cabinets, flat surfaces that see less action than cabinets. Painting just walls and removing scrolly stuff will be a huge improvement. Painted cabinets rarely hold up. I vote for painting although I'm thinking wood cabinetry is or will be coming into favor. 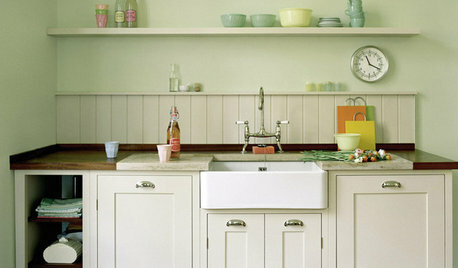 Painting cabinetry can make such a difference in the look of a kitchen and is a fairly easy way to update. Would switch out hardware and remove the scrolled valance over the sink. Honestly, cleaning off a countertop is a very easy way to freshen things up. 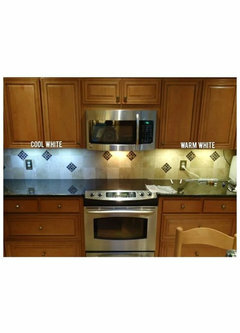 Also, having appliances that match in finish is a great way to update. New countertops for sure even if you use a laminate. Good luck! How long have you lived in your new home? Are you satisfied with the kitchen's layout? As jhmarie pointed out, that's one of (if not the) the first question you need to figure out. Usually takes a good six months to figure out one's optimal kitchen layout and storage needs. I think it all depends on your budget and your time and energy. How much DIY are you capable and willing to do to save money? Etc. As Norwood Architects stated, wood is coming back into favour but that's neither here nor there if it's not the look for you. 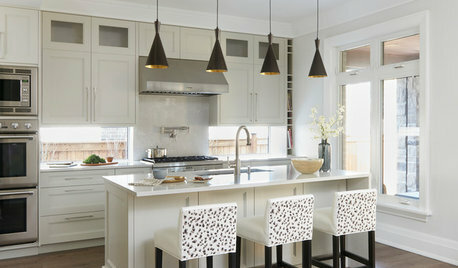 Have you been collecting inspiration pics of kitchens you love? I would seriously consider some of the other advice that others have offered about changes to make before you consider painting those cabinets. As some have pointed out, it is not an easy or a quick job to do to a degree that makes it look good. And, if you are going to pay to have it done, consider that money might be better used elsewhere in that room. The first thing I would do is to get rid of that blue countertop and wall. That, alone will made a hugh improvement! If your oak cabinetry is not pleasing to you, it makes sense to eliminate some of the matching things that extend the same into the dining area, such as those built ins. It isn't hard to remove those kinds of things. 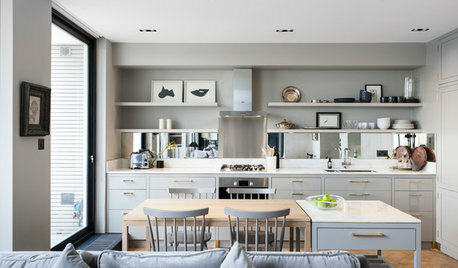 But, keep the cabinets in the kitchen and modernize around it until a time when you might be ready to change them out. That cabinet over the sink would bother me. It seems so low and in your face. Perhaps removing that scrolling would improve it. Also, some under cabinet lighting would help. It seems to back the kitchen sink into a dark corner. Is there no dishwasher in this kitchen? It certainly looks like old folks lived there. 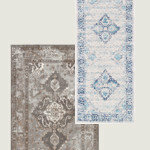 That blue was popular along with anything 'americana" such as baskets and blue ducks and gingham. Then, there is that rack of spices in the little ceramic jars with cork lids. Those things dont' get used and the spices in them just go bad and stale from lack of use and heat of the stove and the whole thing is just a grease magnet. When you do get around to bringing it up the age and replace the range, install a built in microwave. I am probably of the same generation as those old folks. My own kitchen lacks a dishwasher and a microwave. I understand the life they led in that kitchen, but I also understand how it needs some updating to suit the more modern life. When my house gets on the market people will come in and say, "Looks like old folks lived here.". And, they would be right. After a while you just get tired of caring about it and reluctant to spend your resources on it. My house needs so much updating! I understand the old folks with the blue kitchen although I was never a blue duck wall paper americana kind of person. Was thinking about your kitchen and remembering when we moved into our house. The kitchen was original from the late 60s. The layout was ok but what I despised were the wood on wood drawers and unpractical lower cabinets everywhere. The cabinets held stuff but man, oh man, they were a pain to use. One visit to Ikea and I was sold on modern cabinetry. Drawers (everywhere!) that glide like a dream. No more stacking pots and pans in hard to reach lower cabinets. What an upgrade in our everyday life. We didn't end up going with Ikea cabinets but we certainly have glide-full drawers! And I love them every day. So, that - ease of use - might be another consideration for you as you ponder this kitchen. Good luck! Hope you keep us posted. Thank you to everyone who has commented and voted on this. 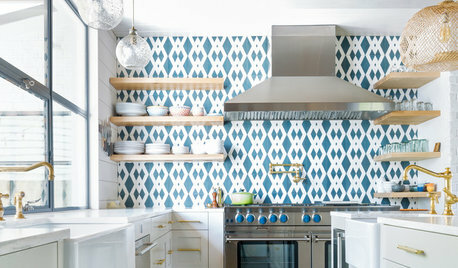 We're strongly considering doing a tile backsplash in either white or off-white. 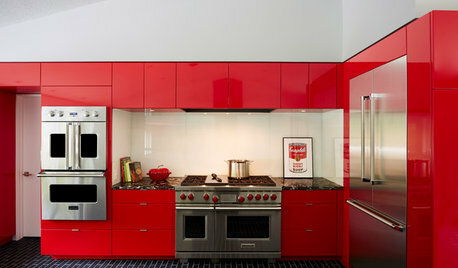 I think it would greatly improve the look of the kitchen without going through the hassle of painting cabinets. We've lived here for one year (September will be two years) and we definitely want to update at some point. There is a light under the corner cabinet (not visible due to the scrolling). There is no dishwasher and I'm not sure there would be room to put one in since the kitchen is fairly small. We'll also be replacing the cabinet handles/drawer pulls to make them more modern. Sounds like a plan. Keep us posted on your progress. Good luck! I think if you get rid of that eye sore bluish colour; it will look far better. When you repaint the room itself, pick a color that compliments the cabinets not a color with a yellowish tint, that fights with them. I wouldnt paint the cabinets. 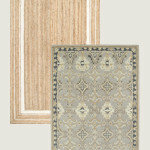 Don’t compete with your neutral hues — complement them! DECORATING GUIDESWhite vs. 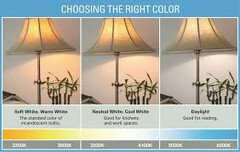 Cream: Which Neutral Paint Color Is Right for You? what should we do with our kitchen? POLL: What's your favorite neutral color? Should we paint the oak ceiling in our kitchen? Ceiling height is 8ft. 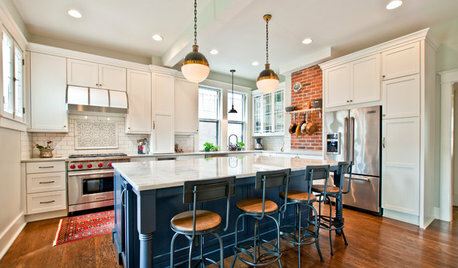 POLL: What color is your kitchen? HELP! 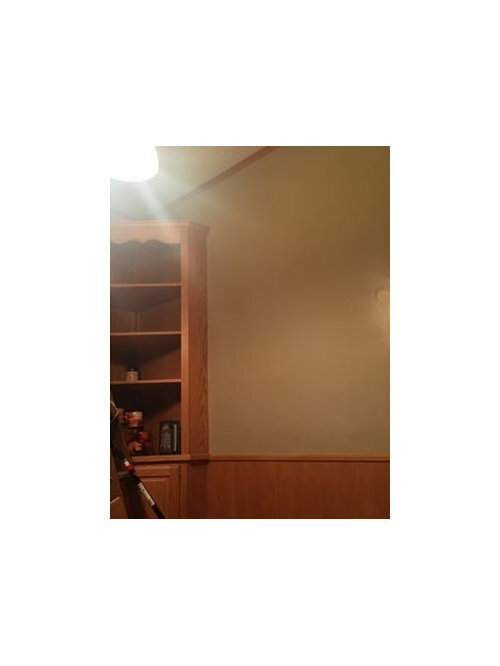 Should we paint our kitchen cabinets? Kohler Vibrant Brushed Nickel - Yellow?? ?